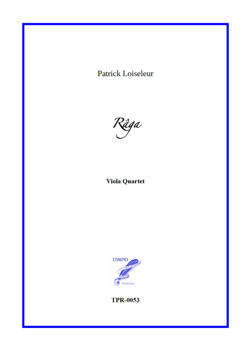 A new classic of the Viola Quartet repertoire ! Since its first performance in 2008 this Râga has been played all over Europe with great success. Synopsis This piece was premiered on June 22, 2008 in Paris, Salle Cortot. It is dedicated to the Absolute Zero Viola Quartet who pionneered with great talent the growing repertoire of original works and transcriptions for four violas. Freely inspired by Indian music and harmonic modes (hence the title Râga), this piece begins in a slow, dream-like motion, and progressively evolves towards more energic and rythmic sections, before concluding on slow, apeased adagio. Pretty much like an improvisation. All four players have an equal importance, and the melodic solos alternate between each of the the four violas, which make this Râga very entertaining and enjoyable both for the players and the audience.